London mayor Ken Livingstone said the blasts which stunned the city were "mass murder" by "cowardly terrorists". But in a defiant message to the culprits, he said Londoners would remain strong "no matter how many people you kill". He said: "This was not a terrorist attack against the mighty or the powerful, it was aimed at ordinary working-class Londoners." Mr Livingstone called for people not to make unnecessary journeys. He said: "Black and white, Muslim and Christian, Hindus and Jews, young and old. It was an indiscriminate attempt to slaughter, irrespective of any considerations for age, class, religion whatever." Addressing the attackers, Mr Livingstone vowed London would quickly recover. "I know that you do fear you may fail in your long term objective: to destroy our free society. And I will show you why you will fail. "In the days that follow, look at our airports, look at our seaports and look at our railways. "Nothing you do, however many of us you kill will stop that life. Where freedom is strong and people can live in harmony, whatever you do, however many you kill, you will fail." The Bishop of London Rt Rev Rt Hon Richard Chartres said: "This is a grave day for London." He was at St Paul's Cathedral which open specially until 1700 BST for those affected by the explosions to pray in private. He also praised the emergency services, saying: "London's clergy have been working alongside the emergency services since early this morning. The churches close to the affected areas have been opened for shelter, aid and prayer. And a spokesman for the City of London Corporation sent its condolences to the friends and family of those been killed and injured in the "horrific terrorist incidents." 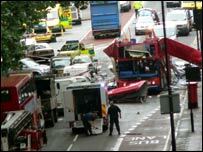 Tony Woodley, general secretary of the Transport and General Workers' Union, which represents bus workers, said: "It is terrible and shocking day." And the Rail Maritime and Transport union expressed sympathy for the families of the dead and called for a security review of the Tube. General secretary Bob Crow said: "These terrible attacks show just how vulnerable commuters and Tube workers are. "Tube workers and emergency services have responded magnificently and there is now a clear need to review security after such an attack." Westminster City Council leader Simon Milton said: "I have been shocked by this morning's terrorist bombings on innocent people and the tragedy they have wrought. "We will not allow this direct attack on the heart of London to destabilise our great city."